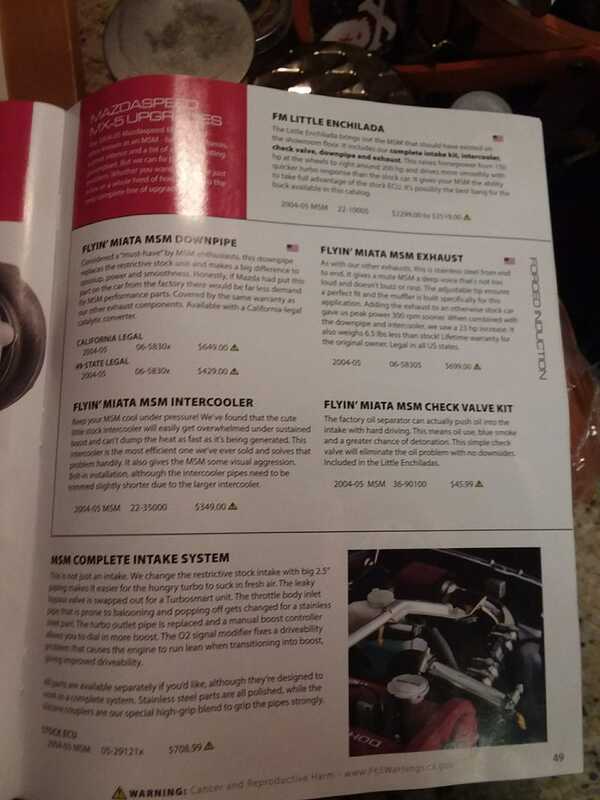 As I prepare to go check out a Mazdaspeed Miata today, I realized that a Flyin Miata catalog had just shown up in the mail recently. I didnt request it but I buy enough Miata parts that I am not surprised to see one show up randomly. So I browsed through the pages over some breakfast this morning until I came across the MSM page. This, along with the page on radiators would be almost necessary in order to reliably track a MSM. However, this means $$$ that I really don’t want to spend. If I am going to have to spend a $2k premium to get into a MSM and then another $1-1.5k on necessary mods, I am left in a hard spot. That nearly $4k extra could be spent on a normal clean NB2 and result in something better for me. Although it is exciting to dream and plan out going that different direction with a MSM. Normally that “extra” cost of entry would be closer to $6-7k due to the starting prices on these which is the only reason why I am considering it. Plus I could piecemeal the mods and really only focus on reliability rather than performance. The beefier radiator, better fans, better intercooler, and oil cooler are basically necesary right off the bat. But even those could be done one at a time realistically. I just would have to worry about overheating on hotter days.